Tinea versicolor is an infection caused by a fungus that is common in adolescent and young adult males. Besides the rash, seen here on the back, there may be mild itching. Frequent sites of infection include the neck, upper chest, and arm pit (axilla). 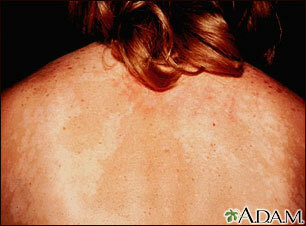 The rash may be white (as seen here) to yellowish to golden brown in color. A tan can accentuate the difference in skin color.